My friend Jen recently left Montreal and gave me her copy of Natural Q‘s first album “C’est La Vie” that she used to own. It was a big indie hit in Taiwan and Chinese-speaking territories, and is, as it should, out of print. It was the first release by A Good Day Records, now a prominent independent label in Taiwan. 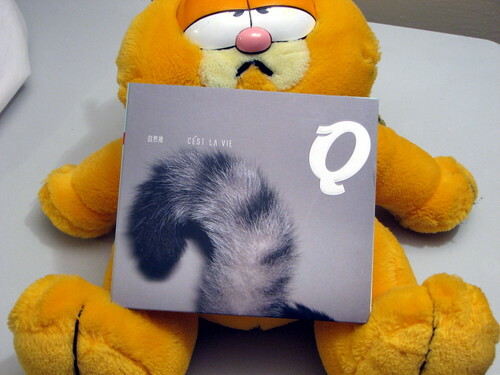 I failed to mention it when I recorded the segment last week, but Natural Q actually released a new album last month. Natural Q as it was known in 2004 (or 2003, when it started) no longer existed after 2006, when female vocalist Waa and Chico split, with Chico keeping custody of the band’s name, and periodically releasing stuff afterwards. The third song (optional, depending on whether Goo Por Yvonne can fit it all) comes from such album, just called “Recycles”, and from Natural Q’s “solo” period. I don’t know why they split, anyhow. So enlighten me, if you do know all the gossip. i think it was something along the lines of Waa injuring her voice and that she wanted to pursue her career in hong kong.